PHOENIX – Every week over the next few months, Swimming World Magazine will feature a camp specializing in teaching swimmers how to improve their technique, swim faster and have fun with some of the biggest names in swimming. Motivation is the part of every package! Programs may include day and overnight camps as well as distance and stroke specialization. This week we feature the Longhorns Swim Camp in Austin, Texas. Thirty-eight years of excellence! Headed by 2012 Olympic and Texas head men’s coach Eddie Reese, 2013 World University Games and women’s head coach Carol Capitani, and assistant coaches Kris Kubik and Roric Fink, the Longhorns Swim Camp is the most exciting camp in the country! Guest coaches and speakers include Olympians Brendan Hansen, Ian Crocker, Josh Davis, Kathleen Hersey, Colleen Lanne’-Cox, Garrett Weber-Gale, Ricky Berens, Whitney Hedgepath, and Jimmy Feigen. Open to male and female competitive swimmers, ages 8 to 18. Camp is held at the Jamail Texas Swimming Center on the University of Texas at Austin campus, home to 19 NCAA team champions. Facility includes a 50-meter by 25-yard pool, and 25-yard by 25-meter pool. Four training groups based on age and ability, with a 1:7 coach/swimmer ratio in stroke technique sessions. Daily training includes challenging long-course sessions Monday-Friday mornings; technique sessions Monday – Thursday afternoons and evenings, with start/turn work included. Classroom sessions on technique and race strategies held. Underwater video of each camper analyzed by a coach. Daily social activities and field trips offered. Multiple-week stays include planned weekend activities with supervision. Experienced, mature, adult staff provide 24-hour supervision. Cost: Overnight Camp $975; Day Camp $875. Sessions fill quickly! 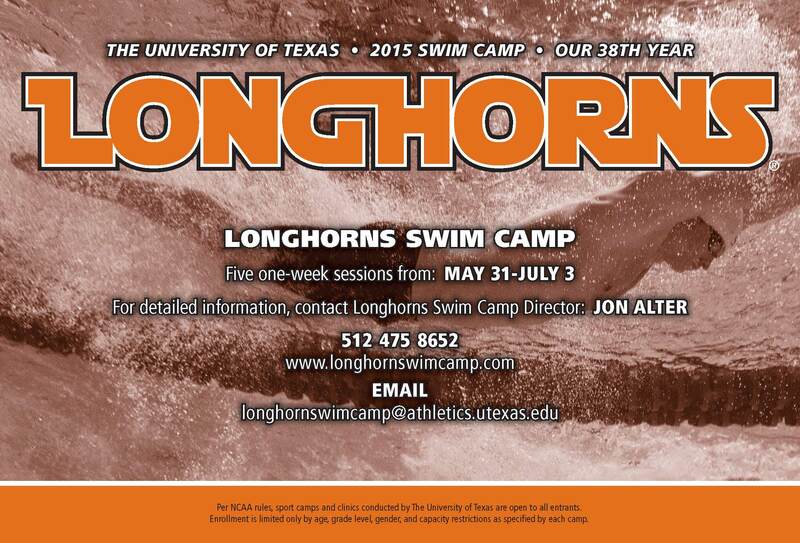 Complete camp information and online registration available at Longhornswimcamp.com. Per NCAA rules, sport camps and clinics conducted by The University of Texas are open to any and all entrants (limited only by number, age, grade level, and/or gender). NCAA guidelines prohibit payment of camp expenses by a representative of The University of Texas’ athletics interest. NCAA rules also prohibit free or reduced camp admission for prospects 9th grade and above. Want To Work At The Longhorns Swim Camp? The Longhorn Swim Camp at The University of Texas at Austin is seeking mature, motivated, and team-oriented individuals to be part of its 38th year! Exciting opportunity to work with world-renown staff: Eddie Reese, Carol Capitani, Kris Kubik, and Roric Fink. Guest coaches/speakers include Olympians Ian Crocker, Brendan Hansen, Kathleen Hersey, Colleen Lanne’-Cox, Garrett Weber-Gale, Jimmy Feigen, and Whitney Hedgepeth. Five one-week sessions (May 31 – July 3). Room, board, parking, $550/session salary, up to $300 travel expense help, and NIKE camp apparel package provided. Applicants must agree to work in an alcohol/drug-free environment, and completed at least 60 hours of college coursework. Competitive swimming and/or teaching/coaching/camp experience required. References, First Aid, CPR, and/or Lifeguarding/Safety Training for Swim Coaches must be submitted. For more information/application, check our employment section at LonghornSwimCamp.com. Completed applications accepted through March 13, 2015, or until positions filled.